Portable Picnic Tables Are Great For Outdoor Environments. 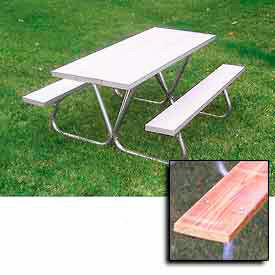 Picnic tables utilize 2 thick x 10 W planks for sturdy, traditional construction. 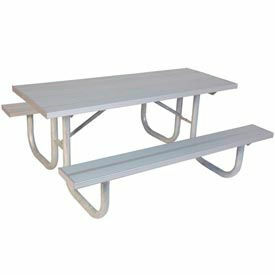 Benches are 18 H. Table top is 30 H. Picnic Tables feature 1-5/16 diameter x 14 gauge tubular steel frame. Measures 58 W overall. Includes hardware. Available in choice of Pressure Treated Wood or Aluminum. Aluminum is made of anodized aluminum with extruded aluminum alloy. Pressure Treated Wood is made of #1 southern yellow pine that is environmentally friendly and kiln dried before and after treatment with rounded edges. 1 Year Limited Warranty. Extra Heavy Duty Rectangular Picnic Tables Offer A High Quality, Practical And Comfortable Seating Solution For Parks And Recreational Areas. Extra heavy duty, all MIG welded steel frame offers superior strength for impact resistance and UV stability. Durable 2-3/8 diameter steel frame with 1-1/16 diameter bracing for extra strength and rigidity. Table top and benches are made of 2 x 10 6063-T6 extruded aluminum alloy planks. Benches have a walk-through design for easy entry and exit. Sled base frame design allows portability. Bolt-through frames with zinc-plated hardware allow surface mounting for permanent installation. Table is 30 D x 30 H. Benches are 18 H. 1 Year Limited Warranty.